By both its supporters and detractors, neoliberalism is usually considered an economic policy agenda. Neoliberalism's Demons argues that it is much more than that: a complete worldview, neoliberalism presents the competitive marketplace as the model for true human flourishing. And it has enjoyed great success: from the struggle for "global competitiveness" on the world stage down to our individual practices of self-branding and social networking, neoliberalism has transformed every aspect of our shared social life. The book explores the sources of neoliberalism's remarkable success and the roots of its current decline. Neoliberalism's appeal is its promise of freedom in the form of unfettered free choice. But that freedom is a trap: we have just enough freedom to be accountable for our failings, but not enough to create genuine change. If we choose rightly, we ratify our own exploitation. And if we choose wrongly, we are consigned to the outer darkness—and then demonized as the cause of social ills. By tracing the political and theological roots of the neoliberal concept of freedom, Adam Kotsko offers a fresh perspective, one that emphasizes the dynamics of race, gender, and sexuality. More than that, he accounts for the rise of right-wing populism, arguing that, far from breaking with the neoliberal model, it actually doubles down on neoliberalism's most destructive features. Adam Kotsko will discuss Neoliberalism's Demons on November 26 at 6pm. Undoing the Demos, by Wendy Brown - This is one of the most influential and philosophically sophisticated accounts of neoliberalism. Though I am often critical of Brown's perspective in my work, she has opened up a whole new perspective on the neoliberal order. The Limits of Neoliberalism, by Will Davies - A sociological investigation of various policy-making circles, this book proves definitively that, yes, neoliberalism is indeed "a thing," while helping to make sense of some of the apparent contradictions between neoliberal theory and practice. A Brief History of Neoliberalism, by David Harvey - This is the foundational classic of the "neoliberal turn" among politically-engaged academics. While his traditional Marxist viewpoint has its limitations, he is better than almost anyone at tackling the hard economic data. Democracy and Other Neoliberal Fantasies, by Jodi Dean - An investigation into the ways that many popular strategies for fighting neoliberalism actually wind up feeding into a neoliberal logic. The Kingdom and the Glory, by Giorgio Agamben - A sprawling and difficult work, but his core insight on the link between theology and economics is absolutely foundational for my argument in Neoliberalism's Demons. Confidence Games, by Mark C. Taylor - In this underappreciated work, Taylor ties together economics, theology, and aesthetics to account for the rise of neoliberalism and identify its blind spots. Among works on this list, it is unique for its relatively positive view of neoliberalism. 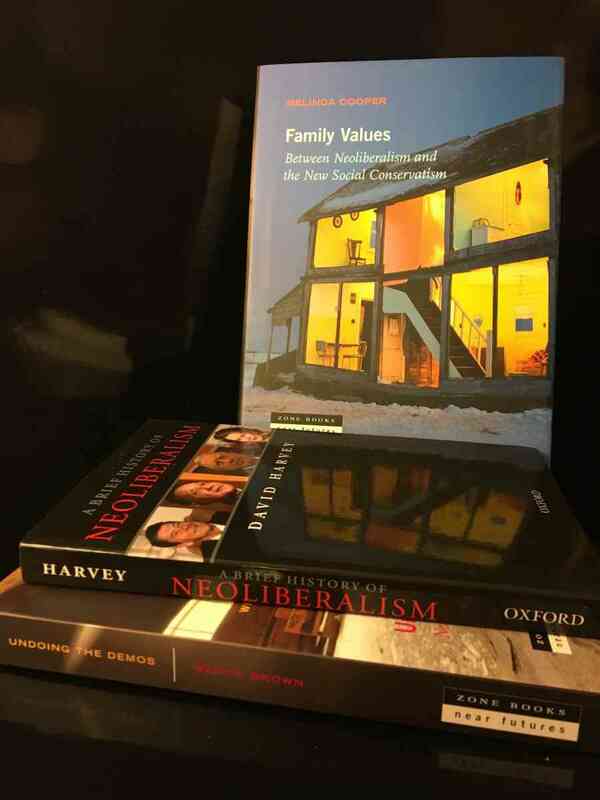 Family Values, by Melinda Cooper - A retelling of the origins of neoliberalism that highlights the role of race, gender, sexuality, and religion from Reagan to Obama. About Adam Kotsko: Adam Kotsko teaches in the Shimer Great Books School of North Central College. He is the author of The Prince of This World and Why We Love Sociopaths: A Guide to Late Capitalist Television, among other books, and his writing has appeared in venues that include The Guardian, The Washington Post, and n+1.